This sort of abuse is depressingly commonplace when women try to free themselves from abusive and controlling men; indeed, if I posted every news account along these lines on this blog I wouldn’t have time to do anything else. 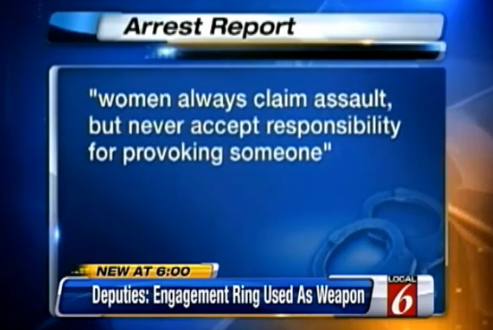 Women always claim assault, but never accept responsibility for provoking someone. That is how abusers think. 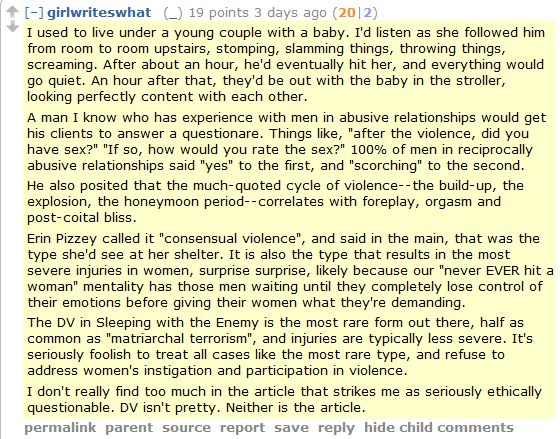 It’s also how a lot of MRAs think. Indeed, when I read Thomson’s reported remarks, the y immediately brought to mind something written not that long ago by Karen Straughan, the YouTube videoblogger who goes by the name of Girl Writes What. Straughan describes herself in her A Voice for Men bio as “the most popular and visible MRA in North America,” and given the rapturous reception her videos get on You Tube and on Reddit, this may not be an idle boast. In the rather revealing Reddit comment I’m thinking of (which I blogged about earlier), Straughan suggested not only that abused women regularly “demand” the abuse they receive, but that many of them also get some sort of sexual charge from it. Oh, I’m sure she’ll deny that she really meant all that, but I can’t see any other way to read the following. Oh, and in case you were wondering what article she’s referring to in the last paragraph — the one she says isn’t “seriously ethically questionable” — it’s a post from the repugnant Ferdinand Bardamu arguing that men should “terrorize” their partners because that’s the “the only thing that makes them behave better than chimps.” For more about that charming piece, titled “The Necessity of Domestic Violence,” see my post here. I’m sure there are some MRAs who are as repulsed by Straughan’s argument as I am. If you’re one of them, and want your movement, such as it is, to be remembered as something other than “the abusers lobby,” you need to call out all those MRAs who make such arguments. Might I suggest that you start by challenging the “the most popular and visible MRA in North America,” otherwise known as Girl Writes What? Um, wow, is daycare out? Not effective, baby huey. Sweetheart, you’re a troll. What, you want us to buy you an ice-cream? You’re too sensitive for this line of errr, work. Delicate, yeah, hellkell. Though it must have been nice to be treated as The-Best-Thing-Ever growing up. Tell that to your fem friend who used the word “owe” in the first place, dear. Bust out the fainting couch and smelling salts, some dude is not having his dudely feelings gently buffered. I was nice to this girl for weeks, but she dated someone else! Given that he’s a member of the MRM I’d say this baby would be a better match if it wasn’t for the whole homophobia thing. The troll quality has dropped off dramatically around here. Dumb or disingenuous? My money’s on dumb. I think he honestly forgot what point he was trying to make. Aw, diddums get a boo-boo, Sic Male? It’s past your bedtime sweetie, you need your rest. Cloudiah, love the spa idea. I’ve been gazing raptly for too long. 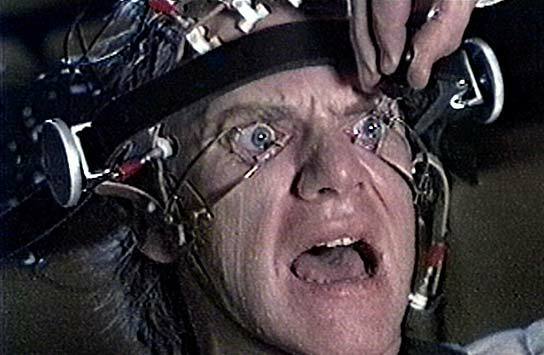 ” rel=”nofollow”>Need eyedrops. He should get some cheese sauce with that whiiiiiiiiiiiiiiiine. Watch the end of the Stewie clip, guys. Yeah, I’m a “speshul snowflake” Shiraz. I know you are, sweetie! The bestest snowflake in the whole world! The Stewie clip is perfect. Okay, I’m going to lose the snark for a minute, and talk to (Sic) Male seriously. Dude. What do you expect? You come onto a feminist blog, and you are not exactly impressive. You don’t say anything smart or incisive. You’re not funny. You whine like a little baby (see clip handily provided by Cassandra). Why should we take you seriously? Why are you deserving of anything more than mockery? ‘Cos frankly, I’m not seeing it. You want respect? Earn it. I don’t get it. I used to word “owe” first, therefore I’m the one who thinks men are owed something? Are you actually trying to make sense, or are you just typing whatever comes to mind? As the economy drops, alcoholism climbs, drug abuse increases… this sort of thinking will increase. Anything to take their mind off the pain of failure, or fear of failure, some men believe controlling their wives will make them whole. As long as women trade their safety for a nice house, there will be misery. However as more women become the bread winners, there will be fewer men needed. Children will look to their mothers, and fear their fathers. Their fathers will roam, afraid of living alone, willing to put up with anything not to be alone again. The mothers have their adult children to comfort them. I am one of those women. Now I am learning that many traditional marriages of my colleagues ended – a union on paper only. Separate housing. My divorce seems to be a mere formality. I left him a long time ago, but he forgets… “…my wife” he still says. My brain is too scrambled, can anyone else parse this? I’m getting stuck on women trading for houses causing misery and men wandering putting up with anything. …necro troll attempted freeform poetry? I really have no idea either. I dunno, my grandfather was a pedophilic veteran of a bunch of wars, and nothing dropped my respect and affection for him like finding out he was a child-molester many times over. Sounds like the plot of some dystopian-future sci fi novel. LBT — this is my problem with automatically respecting veterans, if they’re assholes, then being in war(s) doesn’t negate that! Oh, pecunium, if you should happen to see this, my cousin did 4 and out, so there’s no way you’d have been anywhere near each other, thus answering that — he was out just before you were in. I think I read that. They unleashed their affections on dogs, tanks, and other fuzzy animals. Yeah, our grandfather got the whole gun salute and everything, on account of being part of the Glorious Generation. Ugh. So much anger. Unlike my father, one of my cousins accused him of molesting her. And that I buy. And haven’t mentioned before huh? Yeah, he’s scum.